When tanzanite debuted in 1967, it’s stunning violet-blue color took the luxury world by storm. Unlike those other stones, which are mined all around the world, tanzanite can be found in only one place on Earth: in the remote Merelani Hills in the shadow of Mt. Kilimanjaro in Tanzania, Africa. According to legend, a bolt from the sky set the foothills of Mount Kilimanjaro ablaze, revealing the sparkling violet-blue of Tanzanite below the surface. In recent years, top-quality tanzanite gems have fetched higher prices at auction than rubies, emeralds or diamonds. 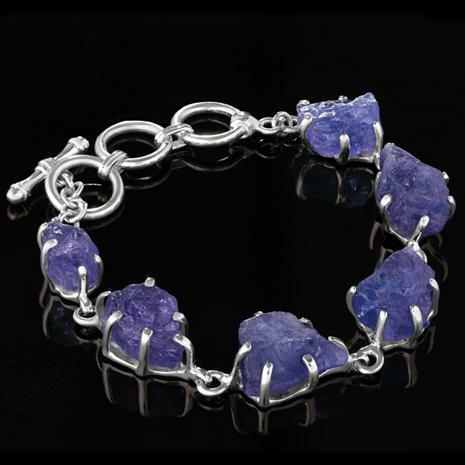 What makes tanzanite so irresistible is its beautiful violet blue color. It’s unlike any color you’ve seen. A color that mimics a gorgeous mixture of the best sapphire, amethyst and blue topaz. We’re happy to bring you carats upon carats of this mesmerizing gemstone. In this collection, generous tanzanite gemstones–– pure and uncut–– are prong set in sterling silver, creating pieces that show just why tanzanite is a hard act to follow.